This is one among the Azhwar Nava Tirupathi. As per the stahala purana, Kamalavathi daughter of Vedasaran, Meditated on the Lord intending to marry only Him. Pleased with her efforts, The Lord embraced her and then married her. Hence this place is also Balika vanam. The Lord slayed the demon Amsarajan in a Mayayuddha at Balikavanam and danced over him and took the name Mayakoothan (Koothu - Folk Dance) at the request of the Devas. 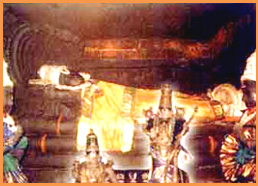 Swami Manavala mamunigal has done a mangalasasanam for this Sthalam. This place is also Known as Periyankulam and it is the farthest from Sivaikuntam/ Azhwar Thirunagri (about 11 KMs Northeast from Srivaikuntam).One can also come here from Thirupulingudi .There are no facilities here. Mangalasasanam Periyazhwar, Andal, Thirumazhisaiazhwar, Thirumangaiazhwar, Bhoothatazhwar, Peyazhwar, Nammazhwar. Direction and Posture Udyoga Shayanam and East-faced. Thirumazhisaiazhwar was graced with Moksha and was accorded with Vaikunda status here. Nadhamunigal revived the Nalayira Divya Prabhandam here, which otherwise would have gone extinct. Also Present: Sanctum Sanctorums for Sri Rama and Chakra Raja. Saarangapani. Aara Amudhan, Abayaryaapthamiruthan and Utthanasayi are the other names of Moolavar. Prathyaksham for Hema Maharishi. Moolavar is in Udhyoga sayana posture (ie) he appears as though is getting up from sleeping position. This temple lies in the Tanjore district of Tamil Nadu. It's about 1 1/2 kms away from Kumbakkonam railway station. Which is on the chennai - Thanjore main line. Bus facility and staying facilities are ample.